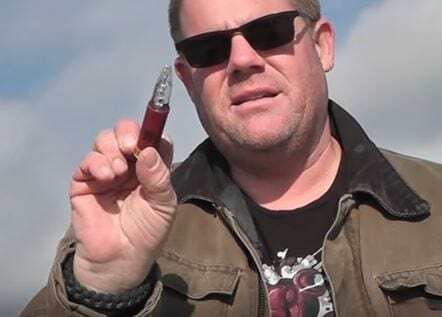 After loading up their 12 gage shotgun with the bullets, which look like a work of art, they tried a spot of target practice and it was simply terrifying. The first clay block didn’t stand a chance, as the slug shattered and completely annihilated it. Next up was ‘Doug’ the dummy, complete with a Level 3 Kevlar Bullet Proof Vest and he didn’t fare much better. The pulverised glass and dust went right through the vest and straight into ‘Doug’. Heck, the bullet could even cut right through a lawnmower engine. Throughout the shooting practice it becomes more abundantly clear that applied in real-life situations this ammunition would be deadly AF.